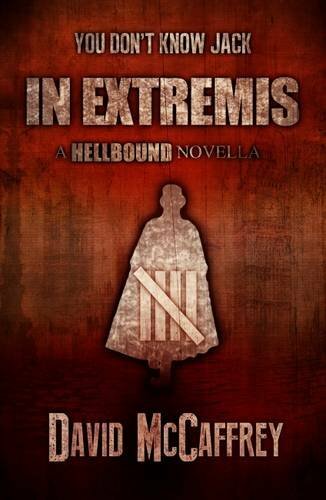 I recently read Hellbound so naturally raced on to read this prequel, In Extremis. The famous Jack of 1888 is mentioned at the end of Hellbound, leaving a gasp of surprise that the reader can only recover from by reading In Extremis. As a nation we have always been fascinated by the anonymity of Jack the Ripper. When the diary of cotton merchant, James Maybrick, was discovered in the 1990's he was accused of being Jack the Ripper although the reliability of the diary has not been corroborated. What is fascinating about Maybrick is the suspicious nature of his death, caused by arsenic poisoning; his wife, Florence, was convicted of his murder. David McCaffrey, using facts and fiction, brilliantly recreates the story of James and Florence Maybrick. 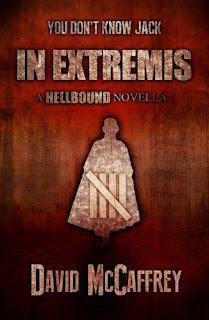 In Extremis could definitely be read as a standalone novella, but it is completely apt that it is a prequel to explain the ending of Hellbound. Instead of recreating the Ripper's crimes, we join the story as the final victim, Mary Jane Kelly, is murdered. We then meet Thomas Quinn, a member of the secret group, The Brethren, as the group decide that James Maybrick has killed his final victim. I really enjoyed In Extremis; although it is a short story, there is so much packed into the book. Linking nicely to Hellbound, but at the same time adding flesh on the bones of the Ripper story. With an extract from the journal of James Maybrick, this is a must read for anyone fascinated with Jack the Ripper.